Home » The Devil’s Half Mile is up for an Audie! 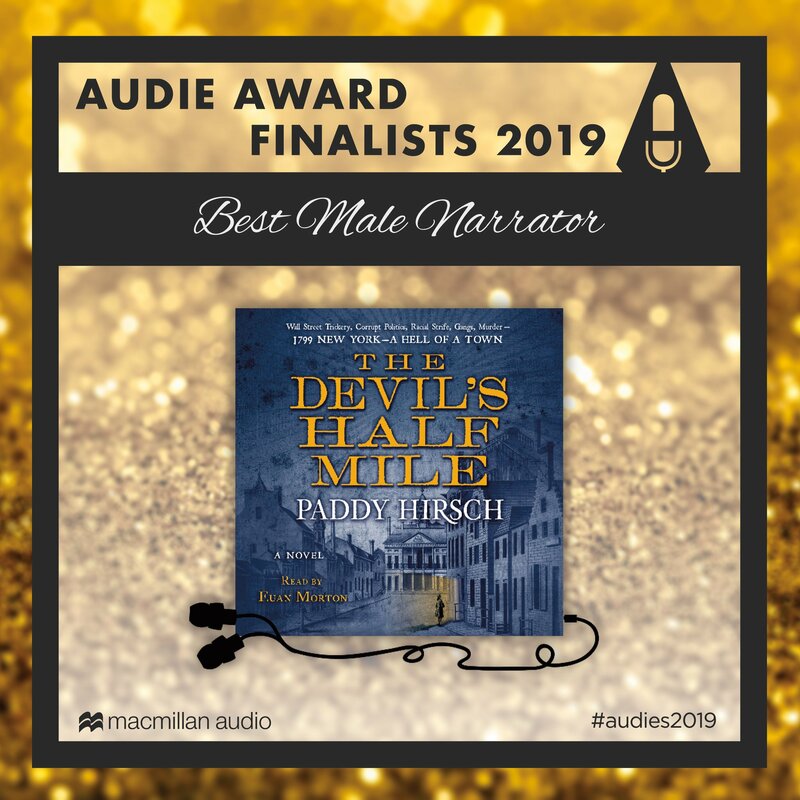 I got the great news this week that The Devil’s Half Mile has been nominated for an Audie Award, for best male narrator. The book was narrated by Euan Morton, who, if you don’t know, is a highly accomplished stage actor. He has way too many credits for me to list here, so I’ll leave it to Wikipedia to fill you in, but perhaps the most notable credit, as far as TDHM is concerned, is his time as King George in the Broadway musical Hamilton. I was surprised and delighted last year, when Macmillan Audio told me that Euan was going to read my novel for the audiobook. But I was stunned by the result. He really does a spectacular job. So good, in fact, that he has changed the way I think about some of the characters myself. When I read the book aloud at events, I often find myself reading the way he reads, and using the voices that he uses in the audiobook. It’s quite an experience. The Audies are the awards bestowed by the Audio Publishers Association. This year’s ceremony takes place on March 4 at Gustavino’s in New York. So I’ll have my fingers crossed that day, for sure. The competition is pretty intense: Billy Crudup reading David Cale’s Harry Clarke; Michael C. Hall reading Stephen King’s Pet Sematary; Tim Gerard Reynolds reading Stuff and Nonsense: Threadbare, Book 1 by Andrew Seiple; and Edoardo Ballerini reading Watchers by Dean Koontz. Yikes! Regardless, it would be an honor to be on the same list as any of those writers, so I count myself very fortunate to have a publisher as supportive as Macmillan Audio, and a collaborator as talented as Euan Morton. A lot of people have asked me why I didn’t read the book myself. I did think about it. I even suggested it at one point, but I’m so glad Macmillan Audio politely ignored me. I can see why now. I’m not an actor, for one thing, and Euan’s performance shows how much an actor can add to the text. And I’m pretty certain the book would not have made the Audie nominations list if I’d been reading. If you haven’t heard the audiobook, it’s well worth a listen. Available at all the usual places, of course, but if you have an Audible account, you can listen there. Also, if you’d like a taster of Euan’s read, check out this excellent story map of New York, based on the book. Click and listen!